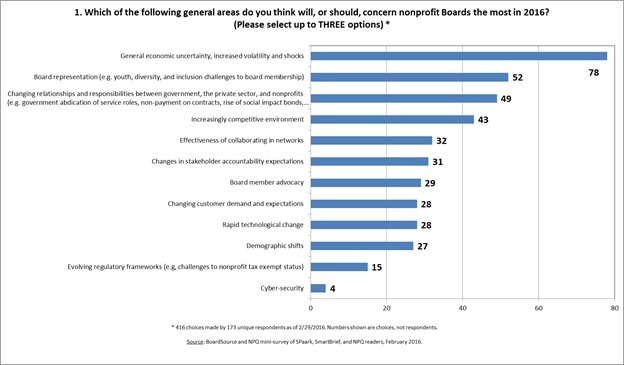 What Are Nonprofit Boards Concerned About in 2016? On February 4th, 2016, NPQ asked our readers to participate in a small “pulse” survey to surface some areas where BoardSource should ask questions in Leading with Intent, its big biennial survey. That is, we wanted to help BoardSource, our frequent collaborator, to tailor its questions to the current concerns of board members. We also asked respondents to choose the one item that they found most pressing and provide us with detailed individual questions on that item. We wanted to share some of the most thought-provoking of these back with you, as well. Understanding how demographic shifts and board representation—being led by, for & about the communities we serve (equity & inclusion) play into the impact of economic uncertainty. In other words, we have to look at income inequality and how that plays out for marginalized communities. Rapid tech change as it influences wealth inequality from a restructuring of the economy and conservative politics, which I think is THE biggest issue for any nonprofit. The end of work, if you will. Again, how can we change the way that we think about board governance & fundraising, especially as demographics change. Financing social change as opposed to fundraising for an organization. Boards as training grounds for leadership of marginalized communities. The environment is changing rapidly in the not-for-profit world. What are some board considerations and changes that can be made to help keep the not for profit upright in these turbulent times? How can NFPs learn to read trends that matter to them so that they are on the front edge of change instead of trying to keep up? Or better, how do they become trendsetters? …and some questions about the changing relationships with stakeholders. Changes in stakeholder accountability expectations. Do board members engage in “generative thinking”—looking forward to the future of the organization; big picture; time for questioning. Changes in stakeholder accountability expectations. Are stakeholders merely asking boards to meet minimum standards & stop “under-accountability-ing,” or are stakeholders asking too much? Collaborating in networks—what kinds of agreements, technology and cost-sharing can be expected, and how can you keep network members equitably engaged to reach the common goal(s)? Particular concern with international networks in developing countries and sharing information/data. Does collaboration between two or more nonprofits enhance resources (revenue, volunteers, etc.) or limit them, and to what extent? And some queries were just too achingly familiar to list. But in general, we found that the responses we received were forward-seeking and far less about legal responsibilities and group dynamics than they were about how to govern an organization such that it can fully engage in an environment that is still forming. We would love to hear any responses or additions you have to these concerns. We will pass them on to BoardSource.